Raising fish in rice paddies brings to farmers in Asia an important source of protein, as well as extra income. 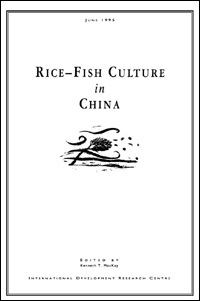 Rice–Fish Culture in China is an important addition to the English language literature in this area. Along with biological and ecological aspects of rice–fish culture, the book addresses its economic and social dimensions. Announcing the recipients of the Joint Canada-Israel Health Research Program’s fourth call for proposals. How the Canadian International Food Security Research Fund reached 78 million of the most vulnerable.